Effortlessly process and render all raw data logs into easy-to-understand visuals with deep forensic analysis. Don’t just see log data, interact with it. Quickly discover where latency is a problem. Maximize your ELB capabilities with real-time monitoring for better troubleshooting. Ensure your users enjoy a fast, clean experience. The Sumo Logic app provides deep insights into lag, IP traffic patterns, alert codes, and more. 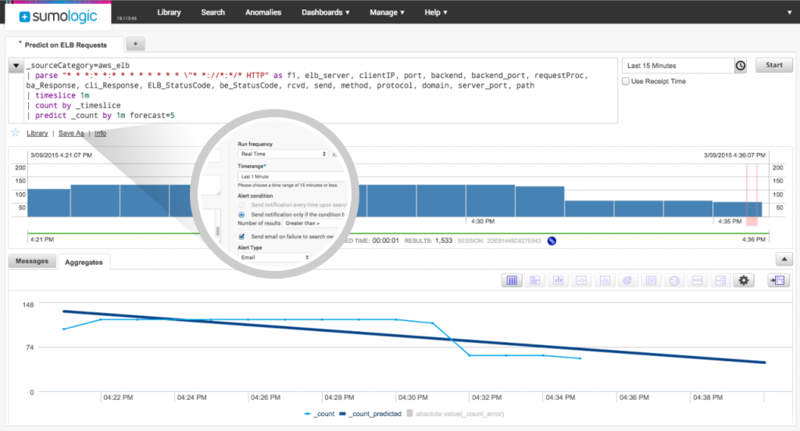 Investigate any activity, drilling down to the smallest log events from customizable dashboards. Assess overall traffic patterns and problems with the Sumo Logic app’s Total Requests and Data Volume Monitor for a comprehensive overview of your environment. 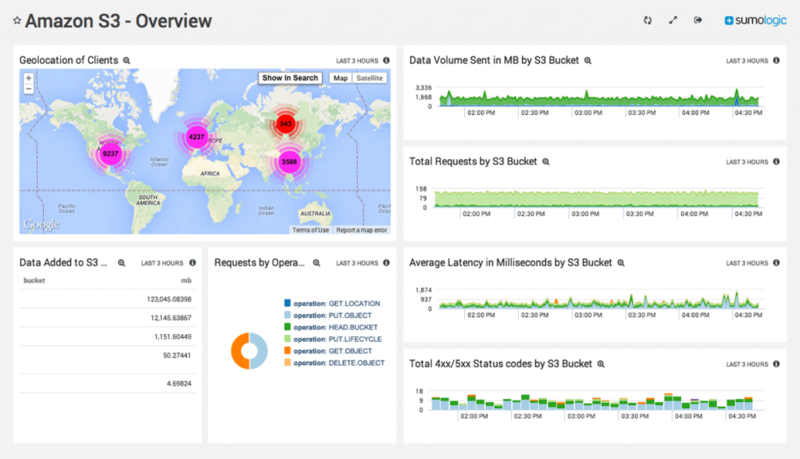 Interact with log data in real-time to study traffic by data volume, load balancer, status codes and more. Automate events to trigger at established threshold levels in AWS ELB, ensuring constantly positive user experience. 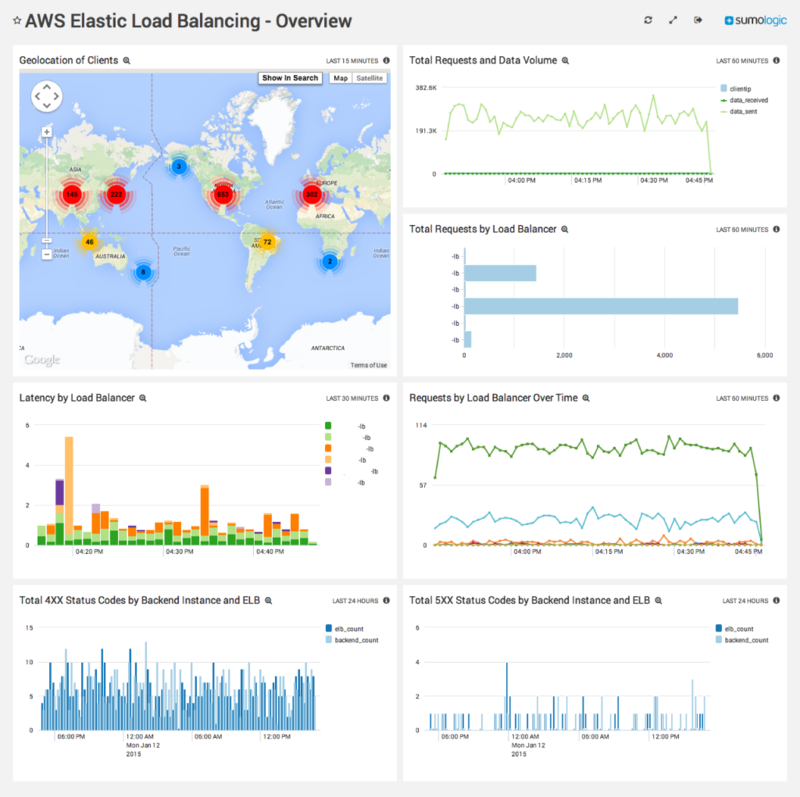 Collect data from AWS ELB and present it more intuitively through interactive dashboards. Visualize latencies by path, client, and backend instances in easy to understand infographics. Just click a dashboard event to learn more about any irregularity. Analyze ELB and backend status code instances to trace their meaning, giving you the best chance to effectively react to latencies. Measure total process time to better understand individual client experience and correct real or potential bottlenecks. Use the information surfaced through the visual dashboards to optimize your ELB configuration across all availability zones. Rather than hunting down needles in information haystacks, act directly on data to improve experience. Chart traffic by user and backend IP addresses. Evaluate traffic patterns with visual infographics that quickly show you where and how your environment is being tasked. Interact with real-time data to adjust environmental settings on the fly. Couple Sumo Logic’s powerful search query language with visual dashboard insights for the most powerful real-time visibility available! 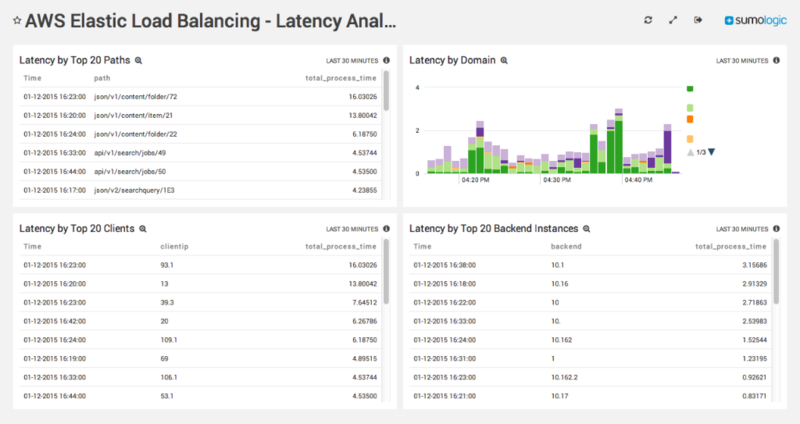 When it comes to your AWS Elastic Load Balancer (ELB) logs, there are a number of different valuable statistics and metrics they can provide. Getting these valuable metrics out of the logs can be a cumbersome process depending on the tools and platforms available to you. Transfer your log data from your S3 buckets to your analytics tool using a secure data transfer. Create dashboards, reports and queries to allow you to visualize the data in near real time. Define alerts based on thresholds. and visualization, and delivers actionable operations forensics.